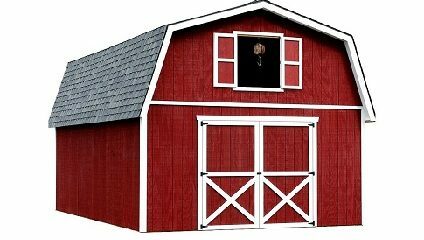 The Roanoke Wood Shed Kits sturdy Structurewood decking and 2 x 8 floor joists hold up the unobstructed loft, giving you a full second story that peaks at 7 ft. 1 in. and amasses an impressive overall height of 16 ft. 2 in. The included barn door is 8 ft. wide and 7 ft. tall. The primed Louisiana Pacific Smartside Exterior paneling has a 50 year warranty and is ready to be painted any color of your choice.